The above info came from Bill, and was edited by yours truly (contact me). The image came from Benvenuti su Inuyasha's portal!. 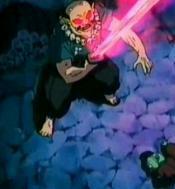 A former student of Totosai, Kaijinbo was expelled for murdering children and using their blood to make an evil sword. 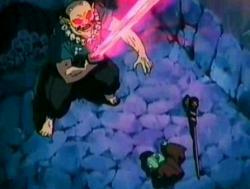 Kaijinbo was sought out by Sesshomaru to create a sword made out of the teeth of the dead Goshinki, a Naraku spawn. He eventually finished the new sword Toukijin, however, the sword posssesed Goshinki's malice through InuYasha and Kaijinbo fell victim under its evil spell. During a battle with InuYasha and the gang, Toukijin made Kaijinbou a tough opponent, even after the ogre's forehead was split open. Totosai returned with the newly repaired Tetsusaiga, however. Still, InuYasha barely defeats Kaijinbo due to how heavy his weapon became. Fortunately for him, Kaijinbou was unable to withstand Toukijin's full power and was reduced to dust. The above description came from Bill and fractyl2, and was edited by yours truly (contact me).